Typical layout of a “bridge site”. Engineers practices building bridges, using this layout in order to KNOW where a part was located on the site. This was especially useful when building bridges at night, as NO LIGHTS were used, and the Engineers needed to find the correct part in the dark. Drivers, when arriving at the bridging site were also trained to drop their loads of bridge parts using this same layout. 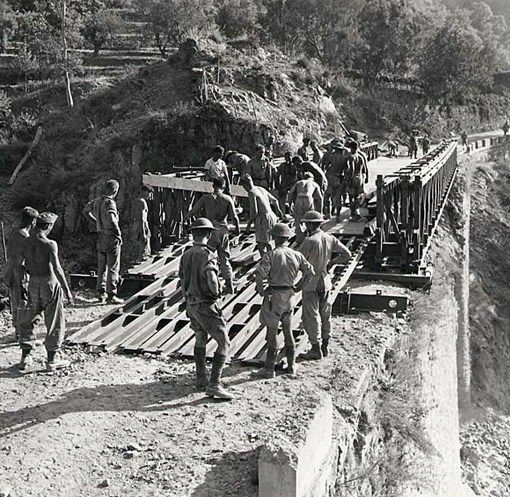 With LOTS of training, Engineer Units could build a typical Bailey Bridge very rapidly, even in the dark, even “under fire” from the enemy. Engineer units regularily practice “speed building” by holding BRIDGE GALLOPS. Engineer units, would take turns building a bridge, the next unit moving over it, building another bridge, and so on. This method of training developed the speed necessary to build these bridges as quickly as possible. Bill Rawling Scientia Canadensis: Canadian Journal of the History of Science, Technology and Medicine / Scientia Canadensis : revue canadienne d'histoire des sciences, des techniques et de la médecine , vol. 9, n° 2, (29) 1985, p. 114-132. Photo shows “landing nose” of new bridge and engineer’s preparing the bank to recieve it. Photo clearly shows the Bailey is 3 panels wide, and two “storey’s” tall.